When an astronomer discovers a new comet, it's named after him, so perhaps we should name 90 percent of the universe in honor of Neal Dalal of the University of California at San Diego and Christopher Kochanek of the Smithsonian Astrophysical Observatory in Cambridge, Massachusetts. The two have reported the most direct evidence yet for the invisible mass that has gone missing from cosmological surveys. Scientists have concluded that the vast bulk of the universe consists of exotic dark matter, a substance that emits no light. Dark matter cannot be observed, obviously, but it should generate a gravitational tug that shapes the behavior of collections of galaxies. Under its influence, moderate-size galaxies such as our own should be surrounded by swarms of smaller galaxies. "The region around the Milky Way should look like the Coma cluster," Kochanek says, referring to a famous, dense grouping of galaxies. Instead, the Milky Way has just two prominent satellites. Dalal and Kochanek hypothesized that the satellite galaxies might be there but might be dark. To find out, they studied distant galaxies whose light has been distorted by the gravitational pull of other, nearer galaxies. Such distortions often create multiple images of the more remote object; the brightness of each image depends on the distribution of mass around the intervening galaxy. The researchers found that some duplicate images are brighter than others. Those variations denote a lumpy gravitational field, which indicates the intervening galaxies are surrounded by small, unseen companion galaxies. The companions probably consist almost entirely of dark matter. Comets are supposed to be big chunks of ice and dust—"dirty snowballs" in astronomical slang—but the most thorough study of a comet's surface to date reveals a bone-dry landscape that is hotter than the Sahara at noon. In September 2001, NASA's Deep Space 1 spacecraft passed within 1,350 miles of Borrelly, a somewhat burned-out comet without much of a tail. The full results of the encounter, reported last spring, show that Borrelly is hardly a wonderland of ice. The surface is exceptionally dark—as black as photocopy toner—and covered with mottled markings. Active regions that emit jets of gas and dust cover just 10 percent of the surface; the rest appears to be dormant and dry. "These pictures have told us that comet nuclei are far more complex than we ever imagined," says Laurence Soderblom of the U.S. Geological Survey, leader of the probe's imaging team. Scientists using a radio telescope atop the 10,000-foot-high Antarctic ice sheet have detected a 14-billion-year-old pattern from the Big Bang. The findings, announced in September by researchers from the University of Chicago and the University of California at Berkeley, support the leading theory of how the universe came to be. According to that model, the universe started out as a hot, formless cloud of constantly interacting particles and radiation. Then 400,000 years after the Big Bang, it expanded and cooled enough so that electrons and protons combined into neutral atoms, which no longer interacted with the surrounding radiation. "At that point, the universe became transparent," says astrophysicist Clem Pryke of the University of Chicago team. The primordial radiation broke free and has been traveling through the universe ever since, giving rise to a glow known as the cosmic microwave background. Large-scale flows in the early universe should have polarized the last round of scattered radiation, causing the waves preferentially to line up. That radiation, now seen as microwaves, should still show traces of alignment in some spots of the sky. Pryke searched for polarized waves with the Degree Angular Scale Interferometer, a microwave telescope near the South Pole. He and his team examined two patches of sky, each about seven times as wide as the full moon. They found a faint but unmistakable signal. 75. What Color Is Your Universe? From a fashion perspective, the universe seems to be stuck in the 1970s. In January two astronomers announced that the overall color of the universe is a psychedelic shade of turquoise. Then, as if taking a cue from their shifting mood rings, the researchers retracted their results and said, no, the universe is more of a pinkish beige. Karl Glazebrook and Ivan Baldry of Johns Hopkins University in Baltimore processed data from the 2dF Galaxy Redshift Survey—a study of more than 200,000 galaxies—and averaged together the light from all those stars. The researchers' aim was to determine the net color of the universe—what people would see if they could somehow observe the universe from outside it. Compared with Earth, with its erupting volcanoes and drifting continents, the moon looks awfully static. Even the lunar "seas"—the sites of enormous lava floods—have been solid for billions of years. But deep down, a flicker of life still burns. Researchers at NASA's Jet Propulsion Laboratory in Pasadena, California, have recently found evidence that the moon has a hot, liquid center. When a colleague asked him how a nearby supernova blast might affect life on Earth, astrophysicist Nir Shaviv of the Hebrew University of Jerusalem thought he knew what to expect: a lot of mutations from radiation. Instead, he found the greatest impact would come from climate catastrophes. 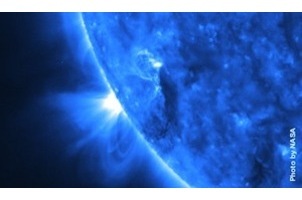 As our solar system passes through regions rife with supernovas, Shaviv reports, Earth may experience a rash of ice ages. Overall, supernovas are rare, but as the solar system circles through the Milky Way, it sometimes passes through one of our galaxy's spiral arms, where large numbers of massive stars form and explode as supernovas. All those detonations fill the spiral arms with cosmic rays, fragments of atoms traveling at close to the speed of light. Shaviv measured the intensity of cosmic-ray exposure in meteorites and found it peaked every 140 million years, each spike presumably recording a passage through a spiral arm. Even health-conscious folks tend to put on a few pounds in the gut as they age. Surprisingly, the same thing is happening to our planet: In August researchers reported that Earth is gaining weight around the middle. Researchers have monitored changes in the distribution of Earth's mass since the 1970s by measuring how its gravity affects satellites' orbits. The dominant factor has been the gradual rebound of high-latitude regions that were covered with glaciers until 10,000 years ago. As a result, Earth's mass has steadily shifted toward the poles—until a few years ago. "All of a sudden in the 1998 data, the gravity field began getting stronger at the equator and weaker at the poles," says Christopher Cox, a research scientist at Raytheon Corporation. (The data took so long to analyze that Cox and his collaborator, geophysicist Ben Chao of NASA's Goddard Space Flight Center, did not see the change until last year.) He first thought that the shift might be a result of global warming, as melting polar ice flowed toward the equator. "But if you dump all that water in the oceans, you'd see it in the sea level, and we haven't," Cox says. Other possible culprits, such as migrating flows in Earth's core, couldn't produce such a large effect. The pace of discovery is picking up in the twilight zone at the outer fringes of the solar system. Starting a decade ago, astronomers began finding large asteroidlike objects slowly circling near Pluto. Now Chad Trujillo, a planetary scientist at the California Institute of Technology, and his colleague Mike Brown have identified a massive hunk of rock and ice that is nearly 800 miles across, the largest minor planet ever discovered in the solar system. The two researchers were examining digital sky images snapped by the Palomar Observatory's Oschin Telescope when, on June 4, they spotted a previously unknown body. Trujillo named it Quaoar (pronounced kwah-o-wahr), after a figure from the mythology of the Tongva people native to California. In their tales, Quaoar is the great force of creation, a being with no form who dances and sings to bring forth the Sky Father and the Earth Mother. In our solar system, Quaoar is probably a leftover of creation, a body that blurs the line between asteroid and planet. Preliminary studies indicate that it circles some 4 billion miles from the sun and is more than half the diameter of Pluto. Was Mars once a water-rich world with rivers and lakes that might have been conducive to life? The planet's surface is scarred with what seem to be flood-carved canyons, but scientists kept failing to find indisputable signs of major present-day water deposits. In February NASA's newest orbiter, 2001 Mars Odyssey, settled the questions by revealing that large amounts of frozen water are locked up at Mars's south pole. "People had calculated that water ice would be stable at the pole, but no one knew whether it actually existed there," says planetary scientist William Boynton of the University of Arizona in Tucson, who is in charge of the instrument that found the ice. Odyssey's sensor could not observe the buried water directly. Instead, it detected hydrogen. Because there is only one hydrogen-containing compound—H2O—that could plausibly exist in abundance on Mars, planetary scientists consider hydrogen a valid proxy for the presence of water. Boynton and his team used the Odyssey instrument to zero in on energetic gamma rays, which are emitted by hydrogen when it is stimulated by subatomic collisions, and on sluggish neutrons that had been slowed down by their interaction with hydrogen. These signals allowed the researchers to peek under the planet's rusty sands for hidden deposits of ice. Black holes are such a staple of astronomical theory, it's difficult to remember that nobody has ever seen one. But in July, astrophysicists Jeremy Heyl and Ramesh Narayan of the Harvard-Smithsonian Center for Astrophysics confirmed one of the strangest qualities of black holes: They have no surface, just an event horizon that marks the point of no return for anything falling into them. Most suspected black holes are surrounded by discs of hot gas drawn by the hole's intense gravity. These discs, rather than the hole itself, are what astronomers see. Except for the speed at which the gas orbits, however, a black hole is largely indistinguishable from a neutron star, a less extreme type of compact object. A neutron star is the remnant of a brilliant star that burned out and collapsed into a ball about 12 miles across, twice the diameter of an equivalent black hole. But a neutron star, unlike a black hole, has a well-defined surface. Heyl and Narayan zeroed in on that difference. Gamma-ray bursts, brilliant flashes of radiation that occur in random directions roughly once a day, have for years been attributed to everything from colliding comets to natural particle accelerators. Recent evidence showed they are enormous explosions in distant galaxies, but no one knew what was exploding. Last April astronomical detectives announced a break: An orbiting X-ray observatory picked up the chemical fingerprints of several elements in a burst's afterglow, identifying the object as an unusual type of supernova—the detonation of a massive, dying star. In the span of a fraction of a second to a few minutes, gamma-ray bursts spew out 1020 times as much energy as the sun. Even so, the objects have proved incredibly difficult to study because they are so short-lived. When astronomers spotted a bright gamma-ray flash on December 11, 2001, James Reeves of Leicester University in England and colleagues in England and Spain leaped into action. Eleven hours later, the researchers had aimed the European Space Agency's XMM-Newton X-ray satellite to catch the fading burst. Within the X-ray glow, Reeves and his colleagues discerned radiation emitted at energy levels associated with several specific elements, including magnesium, silicon, sulfur, argon, and calcium—a mix of ingredients similar to that cast out from a supernova explosion. Tellingly, there was no sign of iron, an element that forms by radioactive decay only many days after a supernova.